Adaptable NMEA 0183 Buffer with two OPTO-isolated inputs and twelve ISO-DriveTM isolated outputs, making ground loops a thing of the past and keeping devices safe from damage. Introducing the Actisense® Professional NMEA 0183 Buffer (PRO-BUF-1), the first product in the new Actisense® ‘Pro’ range. 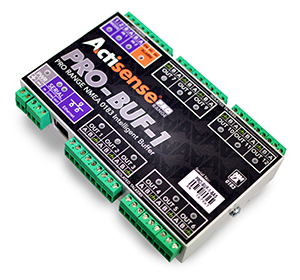 As with all Actisense® products the PRO-BUF-1 is reliable,> robust and provides galvanic isolation on all inputs and outputs as standard. With two NMEA 0183 inputs, an impressive twelve NMEA 0183 outputs, a bi-directional serial port and an Ethernet port, the PRO-BUF-1 is a perfect solution for larger leisure vessels and commercial shipping. Three pre-defined modes of operation are designed to suit the majority of NMEA 0183 systems making the PRO-BUF-1 ready to go ‘out of the box’. The web browser based configuration tool has many advanced features to allow full customization of the PRO-BUF-1, and as the configuration tool is web based, it is compatible across all popular Operating Systems. No internet connection is required, simply connect directly to the PRO-BUF-1 Ethernet port. To make installation quick and simple, other useful features include pluggable connectors that allow use of screw terminal or screwless plugs, and a DIN rail mount option. Helpful LEDs indicate power, data in, data out and alarm status to aid diagnostics. 2 x NMEA 0183 OPTO-isolated inputs. 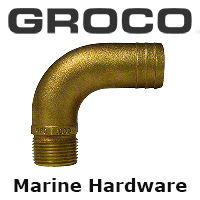 12 x NMEA 0183 ISO-Drive™ isolated outputs. 1 x bi-directional isolated serial port. 1 x Alarm output (N/O and N/C contacts). Four pre-defined modes of operation.